One of the professors at Central Seminary gave a talk last night about Biblical geography (specifically the Shepelah hills west of the mountains), and gave some fascinating insight into Solomon's marriage to Pharaoh's daughter. Ever notice how he built her a palace away from the Temple, as she was a pagan? Dr. Beacham noted a real reason for the marriage; Pharaoh captured Gezer, along the strategic road to Joppa, for Solomon as a dowry for her. In short, Solomon effectively posted a personals ad saying "wanted; woman with truck. Please send picture of truck." Pharaoh gave him the truck, and a nice one it was, too. In "very sad" news, I believe it's mere days until my television will no longer receive broadcast TV programs. Not that I'll notice. I was thinking today that a great part of the lack of thinking might have a lot to do with our dependence on the idiot box. If you're wondering how to improve your thinking, turn it off for a while and see what happens. You just might be very surprised. 1. Obama's stated purpose of getting someone "with empathy" onto the Supreme Court, undermining the rule of law. Sorry, the Court is all about the law, not about empathy. 2. Sotomayor's stated view of the bench as a place for making policy--not its actual purpose of applying the law. 4. Sotomayor's 60% reversal rate in the Supreme Court (probably to become 67% when the case she ruled on regarding discrimination against white firefighters gets there). 5. Sotomayor's history as a Schumer nominee (Schumer forced Bush to accept his nominees to get Bush's through) and a Clinton nominee. 6. Sotomayor's position on the 2nd Amendment, directly contradicted by the Heller decision and the plain text of the 2nd Amendment. Anyone out there have some more? Really, any one of these ought to derail her nomination, and #2 and #3 really ought to result in impeachment hearings, not a Supreme Court nomination. ....at the "Blog Wedding of the Millenium" was this. Hopefully Night Writer can get some for Ben and Faith by their first anniversary! Yesterday, while waiting for some car repairs to be completed, my son and I had the opportunity to take in bits of an afternoon soap opera. While thankfully my reading material was good, and I didn't catch too much of the "plot," the advertisers gave a fascinating glimpse into a typical soap opera viewer. A quick list; a couple of antidepressants, joint pain medication, diabetes medication, frozen comfort foods, and Wal-Mart. One would infer that the typical viewer of "Field Marshal Krankenhaus" is overweight to the point of joint troubles and type 2 diabetes due to over indulgence in comfort foods, and is somewhat down about the whole deal. Since this is a "family" blog, I won't comment about what typical football commercials--beer, cars, and vasodilators--might say about typical football fans. "Kiddo, I've been struggling with the lust of the eyes for decades now, and reality is that that [insert article of clothing here] draws the eyes right to your [insert body part here] and is going to lead a young man's mind (as if he needed the leading) somewhere else than the contemplation of your sterling conversational abilities and quiet spirit. Just trust me on this one." As one taking part in the Pelosi/Obama/Biden recession, one has to take it easy on spending. On the other hand, I did have the opportunity to give my ten year old daughter a hot new ride for only forty bucks. A 1975 (or so) Schwinn Collegiate. No kidding. With springs under the seat, swinging your leg across the saddle of this hot rod is like going from a one ton Dodge to a Caddy, even if your legs are six inches longer than your daughter's. I found the bike in a junk pile at a friend's house, picked it up when I saw the old Schwinn badge, and discovered to my delight that apart from dead tires and a touch of rust, it was in really good shape. With new tires, she took it 18 miles without getting tired. If you're in the market for a good bicycle, don't ignore the oldies but goodies. They can save you a lot of cash, and prevent you from getting saddle sore to boot. Apparently, the same head of the Heimatssicherheitsdienst (Department of Homeland Security) who cannot figure out that you don't accuse veterans of being terrorists without providing evidence is being considered as a possible nominee to the Supreme Court. Are there no competent legal minds out there that we could tap for this position? Perhaps not. If nominated, hopefully the ABA reminds President Blago of the fact that the exercise of law does, in fact, depend upon the facts presented. We have an elected official who raised large portions of his funds from unions. The same elected official overrode bankruptcy laws (in clear violation of Article 1 of the Constitution, which requires uniform bankruptcy laws) to award one of those unions billions of dollars of company equity to which they are not entitled under bankruptcy law. There is as of yet no impeachment filed in the House of Representatives. Why not? This is clear, obvious corruption. My heroic ten year old daughter had earned her choice of weapons by writing out ten chapters of the Bible. I had to get her something good. Not what you were thinking. But close. Apparently, people in the Blagojevich (oops, Obama) administration are advocating a tax on carbonated beverages to "help health." One wonders if they ever considered doing an even better thing by ending subsidies for growing corn and sugar, and maybe they could create an even greater incentive to good health by working to return healthcare to the free market. Apparently, the new Yankee Stadium (costing $800 million or so) is so overpriced, they can't even sell out seats when the Red Sox come to town. Great idea, y'all. I remind this forum that Wrigley Field was built for only $250,000($5 million adjusted for inflation), was funded completely with private money, is still in use, and is the best ballpark in the league. When you pay attention to ROI, you get Wrigley Field sold out. When you don't, you get the new Yankee Stadium. As an engineer, I've always been fascinated as colleagues go off to other jobs, presumably better paying, in the large, nebulous field of "finance." And so yesterday I took a look at my dictionaries to see what the origins of the word might be. 1990 dictionary: from the Old French "finans," or "ransom." Noah Webster's 1828: from Latin and French words meaning a "fine." Hmmmm.....I may yet decide to start demanding ransoms or fines for a living, or I may realize that modern word usage isn't completely hostage to etamology. Hopefully the latter, but I figured my "vast readership" might enjoy the irony of one of our most respected (and disrespected) professions having its root in feudal hostage-taking. 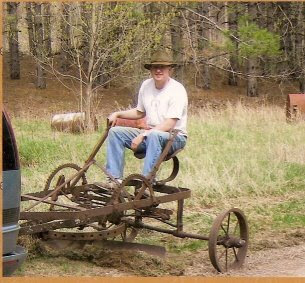 Yes, a friend and I took an ancient grader (I'm thinking 1920s era) and figured out a way to tow it with a minivan. It is amazing what you can do with old equipment and a moderately powered vehicle, to put it mildly. Site is my church's camp near Somerset, Wisconsin.